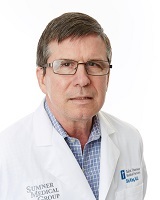 Sid King MD is the managing partner for the Sumner Medical Group (SMG) in Gallatin Tennessee. In 1996, he led the merger of a four man Internal Medicine practice and a three man Family Practice group to form SMG. SMG is now a twenty six provider multi-specialty group. In addition to his management work , he practices Internal Medicine. His management experience includes being the medical director and chairman of the board for the Tri-County IPA from 1996 to present and a board member of the Quality Care Medical Network, an IPA. He has served on advisory boards with the following payors: Health 123, HealthNet, HealthSpring and Universal Care of Tennessee . "Outcomes-based Compensation : Pay-for-Performance Design Principles" and the 2005 summit "Improving Care Coordination Through Physician/Disease Management Collaboration ." In 2004, with Dr. Jim Geraughty , HealthSpring Tennessee , and American Healthway's, Dr. King helped develop a pay -for-performance program that closes the gaps that exist in traditional payor-disease management company-physician models. In 2006 he was on the development team for the LivingWell Health Center, a Patient Centered Medical Home. LWHC is a partnership between SMG and HealthSpring and serves 2,250 Medicare Advantage patients. Dr. King is presently the Medical Director at LWHC. Dr. King served on the Sumner Regional Health System (SRHS) Board and Executive Committee from 1994-2004. He is a member of the Quality Committee at SRHS. Dr. King graduated from The University of Tennessee College of Medicine in 1976 where he was elected to the Alpha Omega Alpha Honor Medical Society, presented the Upjohn Special Achievement Award, and was voted by his classmates as the "Most Promising Physician." He completed his Internal Medicine residency at the City of Memphis Hospitals in 1979. He became certified by the American Board of Internal Medicine in the same year. He was selected as one of the "Best Doctors in America" in 2000.